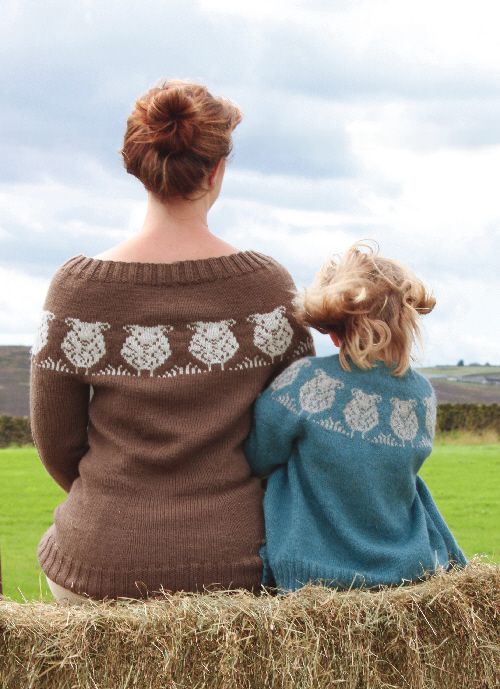 They provide us with the best fibre known to humankind, so of course knitters love sheep! Declare that love with this stylish pullover, designed for everyday wear in cool climes. With a cleverly scooped circular yoke, and princess line shaping, Wethers will flatter all curves and none. It will definitely suit ewe! Yes, it’s knitted from the top down in the round. Yes, it is seamless. This is a very pleasurable knit! To fit 32(34:36:38:40:42:44:46: 48:50:52:54:56:58)” chest. The finished chest measurements include 1–3cm/¾–1¾” positive ease. 2 colours of heavy DK/light aran/worsted weight yarn with approximately 218 metres/238 yards per 100g. You will need 10(10:11:12:12:13:14:14:15:16:16:17:18:18) 50g balls of your main colour (MC) and 2 x 50g balls of your contrast colour (CC). The pictured sample was knitted with Blacker ‘Swan DK’ in Earth (MC) and Pale Maiden (CC). 4.5mm/US 7 needle(s) for small diameter (sleeves) and large diameter (body) circular knitting. Adjust needle size as necessary to achieve correct tension. 21 sts and 32 rounds per 10cm/4″ in stocking stitch after blocking. 25 sts and 32 rounds per 10cm/4″ in stranded pattern after blocking. Adjust needle size as necessary to achieve the specified tension/gauge.